My files look nothing like this and the tabs are wearing down. Mostly I dislike the lack of continuity -- some printed, some scribbled in fat markers of varying colors. 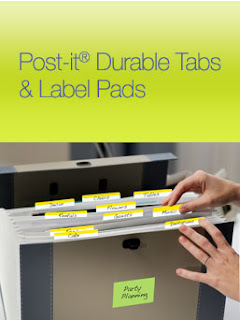 Post-it® freebies are typically standard-supply size, not eeny samples, so may be worth going here to order your free sample of Durable Tabs and Label Pads. Sent to you via US Postal mail.